I have been hearing a lot of talk lately about the cute, inexpensive native bee houses for sale. Pinterest is full of plans for adorable bee hotels. And while I love that there is enough interest in raising native bees that companies are offering products for that purpose, I am at the same time disappointed (and yes, a little angry) that what they are selling is possibly worse for our bees than doing nothing at all. Let's be clear. I absolutely want people to have bee houses that are nice to look at. It's not just about functionality. But functionality should definitely come first. Don't be fooled into buying a substandard house. Because no matter how cute or how cheap it is, the bees are the ones who will regret it. So let's take a look at what a house should have, and what it should not. A native bee house can by tiny, but it must bee deep enough to safely hold tubes that are about 6" long. A house can be made to hold any number of bees/tubes. But the overall depth of a house matters. Why? 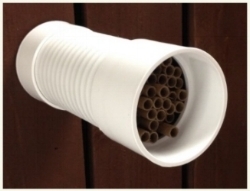 Because mason bees will place only female eggs, usually one or two, into the back of each tube. The rest of the tube will be filled with male eggs. A 6" nest tube is ideal. This is the depth that the bees look for in nature, and provides the right ratio of male to female eggs for optimum growth in numbers the following season. Tubes that are either shorter or longer throw off this ratio. In addition to the tube length, the house itself should be slightly deeper than the tubes. An inch or more is best. This protects the nesting holes from the elements, including wind and rain. It also gives some shade to leafcutter bees in the summer, as direct sunlight can dry them out before they exit their cocoons. All other aspects of size size are up to you, as well as the shape and building material. I have beautiful round-roofed houses, cabins made of cedar, and even recycled plastic coffee can houses. As long as the depth is correct, and the tubes are the right length, it works. "Bamboo is a natural material but it is also exotic and our native bees have not evolved to nest within it (even though they will use bamboo if nothing else is available). Bamboo openings can vary greatly in size and many will be either too large or too small. Bamboo tubes are such a strong material that they can't be opened for harvesting cocoons without harming the bees... Bamboo also doesn’t allow the pollen loaf to breathe and mold can grow too easily." This blue orchard mason bee isn't wearing a brown girdle. She is covered in tiny pollen mites, which will be spread to every flower she visits. If the opening in the tube is too small, bees will not use it. If the opening is too large, the bees will spend excess time and energy having to build jumbo-sized partitions between each egg, which significantly reduces the number of eggs that she will lay in her lifetime. Some people avoid the issue of bamboo being too strong to open by simply not harvesting the cocoons at all. The issue there is that we have a mite problem. I'm not talking about the varroa mite that attacks honeybees, I'm referring to pollen mites. These mites eat the pollen loaf stored for baby bee larvae, starving them before they even get a chance to fully develop. Furthermore, when you do not harvest your cocoons, the surviving bees will have to exit the tube by crawling through the chambers that contained pollen mites. They will pick up the mites, carry them on their bodies, and deposit them on the flowers they visit. There, the mites are picked up by other bees and spread even further. We must harvest our cocoons to break this cycle, and bamboo simply doesn't make that possible. In some ways, it is equivalent to going to a stadium with the flu. You are bound to get others sick, and that's just not a nice thing to do. So how about a drilled block of wood? Nope. The inability to harvest the cocoons has the same result as the bamboo. This is different than a wood tray that can be opened up for harvesting a cleaning. Wood trays are safe to use, although in my experience the bees prefer individual nest tubes. Houses that have their tubes glued in place can be troublesome because the tubes can't be removed for cleaning or harvesting. So even if the material is right, if they are glued into the house then your bees will be stuck with mites, parasites, etc. If the house is the right size and you love it, and you can get the glued tubes out without destroying it, then go ahead and keep the house. But replace the tubes with proper nesting materials. Many houses have tubes that are open on both ends. They may be partly glued into the back of a house, but the ends are still open. This can be an issue because the bees do not like too use open tubes, so they may refuse to use the home you have set up for them. In addition, pests such as mono-wasps can get to the back of the tubes where they will lay their eggs inside a developing bee, which kills it. Because the female eggs are usually in the back of the tube, this primarily results in a lack of female bees the following spring, along with the increase in the local mono-wasp population. To avoid this, nesting materials should be closed of entirely on the back side, or left with only a pin head sized opening. Stackable wood trays should have the back side completely covered with a layer of cardboard, held firmly in place with rubber bands, zip ties, or the like. All of this talk of mites and diseases and parasites can make it seem like raising native bees is a lot of work. It's really not! You can expect to spend one to two hours per year actually working with your bees. The rest of the year, you get to just sit back, enjoy watching them, and reaping the rewards of their efforts. So go ahead and get inspired. Buy a house of the right size and paint it your way. Make yourself the Taj Mahal of bee houses. Or a rustic farm style bee house. Or make one out of recycled materials that looks like a unicorn riding a dragon with lasers for eyes. Use the images below for inspiration, but do it yourself the right way, now that you know what that means. Have fun with it! My very first mason bee house, stenciled with fern fronds. An architectural bee house from Pinterest (click for source). Note that the clay cylinders are plenty deep for 6" tubes. One of several ready-to-use bee kits available that are actually made for bees, not for profits. Houses can be made of anything. These kits are made with simple PVC pipe and can be tucked away in small spaces. A hotel for a variety of creatures from Pinterest (click for source). These can be great, but research carefully before you build one yourself to make sure you are providing a healthy environment for each insect. My most active mason bee house. Consider placing your house near a pathway to encourage visitors to watch the action. It's completely safe, as mason bees are gentle and do not have a traditional bee sting.